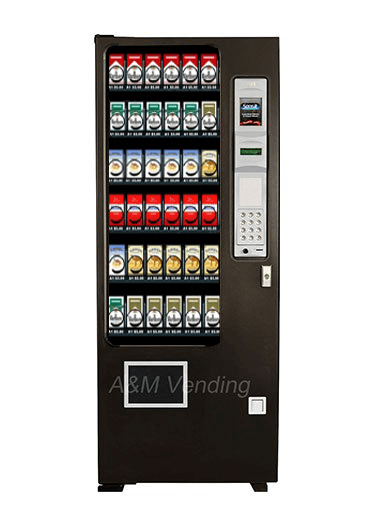 The Ultimate Cigarette Machine has a small footprint but carries a large variety and capacity of cigarettes easily presented in a glass front vending machine. The Ultimate Cigarette Vending Machine- The ultimate cigarette vending machine is the perfect machine to quench your cigarette addiction. Although the Ultimate Cigarette Machine has a small footprint, yet it carries a large variety and capacity of cigarettes, easily presented in a glass front vending machine. Presenting these snacks on glass front allows the buyers to choose whichever brand of cigarette they like from the display. The Ultimate cigarette Vending machine has been reconfigured in our plant under the professional eyes of our experts and therefore we can guarantee you a wonderful experience having the machine around and vending your favorite cigarettes through it. It can be planted in smaller areas and it can vend about 36 different items at a time. The cigarettes within can range from $5 to $100, which means there is something from everyone here. Small footprint machine but able to vend 36 different items. Pricing from 5 cents to $100.00. Guaranteed Delivery System – customer will always receive their merchandise. Deeper hopper design accommodates more items. The Ultimate Cigarette Machine Can also be reconfigured to vend lighters, chewing tobacco and all other cigarette items. items. Credit card reader is able to keep up with all the sales in the machine and will be inputted on line in your computer. 3 year parts warranty excludes fluorescent lights, glass, and paint finish. Shipping not included. Parts readily available usually ship same day through A&M. 28 ½” wide, 29 ½” deep and 72” tall. 36 selections hold 10 packs each. Validator & Changer Validator accepts $1,$5, $10 & $20 bills. 5 Tube changer dispenses $1 coin, quarters, dimes, & nickels.